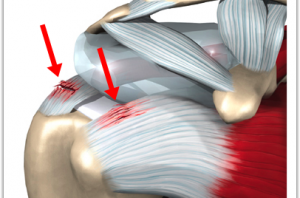 One of the most common injuries to the shoulder is the rotator cuff injury. The reason for this is because the shoulder joint is supported by more muscles than any other joint in the body. The groups of muscles involved with the rotator cuff injury are the SITS group Suprapinatus, Infraspinatus, Teres minor and Subscapularis. The major reason there is an injury to the rotator cuff is repetitive use of the upper limb above horizon (e.g., during throwing, swimming, and weight lifting) or a fall on an outstretched arm such as when skiing or snowboarding. The recurrent inflammation of the rotator cuff (especially the inflammation that occurs to the Suparapinatus tendon) can lead to tear/rupture of the muscles/tendons. Third-degree strain, severe shoulder pain, 6 to 12 hours of no pain followed by gradual increase in pain and disability. At Mountain View Pain Center our chiropractors specialize in sports related injuries, we will design a treatment plain that will ensure you get out of pain, but most importantly you stay out of pain. Our treatment plain will include physical therapy, chiropractic care, and a rehabilitation program to help you stay out of pain. We are conveniently located for all the major cities Denver, Aurora, Lakewood, Parker, Littleton, Highlands Ranch, Centennial, Cherry Hills, Lone Tree, and Green Wood Village, Colorado.